There’s a law for the way languages change that backs up Intelligent Design. For over 300 years the official language of the English court was…French! Seriously. But the English were always fighting the French. That’s true. Find out why. There’s a reason we write “knight” but say “nite,” and you won’t believe how they used to pronounce it. It was once punishable by death to translate even portions of the Bible into English! Yikes! These fascinating facts, and much more are contained in Laurie White’s book King Alfred’s English. I highly recommend this book to anyone interested in language history, linguistics, and the history of the English Bible. I also think it should be recommended reading for all high school students as part of their English studies. 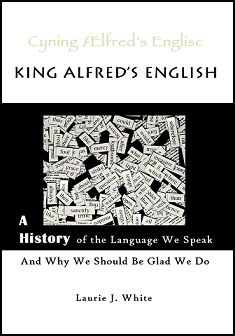 You can find King Alfred’s English for a price of $14.89 at CBD (not an affiliate link). You can also locate it at Amazon (which has a Kindle version as well) and Rainbow Resource. To find out what others thought about the book, use the link below. This sounds very interesting Lisa. Thank you for sharing your honest review. Isn’t it frightening to think that people actually were put to death over translating God’s Word into English?? Doesn’t it make you all the more thankful for the Bible that we have in our own language?? God is Good!! The book really opened my eyes to the amazing process it took to get the Scriptures into our English language. I am very thankful to be able to have the Bible in English!